An oldy but a goody, ceramic tiles are one of the oldest ways to finish your kitchen. They come in a range of sizes, colours and styles to suit every need. The trend in 2019 is still the subway tile (being small and many) look in your kitchen. Easy to use, although a professional Tiler is recommended to get that seamless and flat finish. For a true country feel in your kitchen you may choose to utilise Timber Lining boards as a splashback feature. Keep in mind that if you are using timber to create a country feel, keep it well away from your gas cooktop as any timber will be highly combustible. If you’re ok with a stainless steel sheet in place of timber in that area and you want a country kitchen, then this may still be a viable option. If you want to feel like you’ve stepped into the mediterranean in your own kitchen then natural stone will give you the look, feel and depth you’re looking for. Used for centuries due to its natural heat and moisture resistance it can be used throughout your kitchen. It’s natural hues give you a great random look that hides any small splatters or kitchen mishaps and it’s easy to maintain. It will, over time, absorb oil and it isn’t the cheapest product to work with, but with some backlighting it can really light up your kitchen. The cheapest option around for your kitchen Splashback is laminate. It comes in a huge range of colours, styles and patterns. It is easy to use and install as a DIY project. You can match your colours to your doors, or benchtops to make your kitchen seamless. Great for wet areas, the only challenge comes for the long term wear and tear as it does expand and contract over time. Raw bricks can give you a great rustic feel in your kitchen space. If bricks already exist they can be incorporated into your kitchen, but if they go all the way to your benchtop you may find it a bit difficult and expensive to make your benchtop meet your bricks perfectly. They are also a nightmare to clean, so maybe choose a material over the top up to the splatter area line and expose the bricks above. Kitchen Glass Splashback is by far the most versatile and hygienic choice when it comes to splashbacks. Glass comes in all the colours of the rainbow and a few you’ve probably never heard of. It can be patterned or flat colours and can even come with a picture of your favourite destination, or a collage of family. Pressed metal gives an elegant and different look in any kitchen although it is extremely thin making it hard to clean. It also may not stand up to the normal wear and tear of a modern kitchen. Saying that, if you’re after a modern, yet rustic look pressed metal may tick all the boxes. With so many options, it definitely is hard to choose the right one for you. 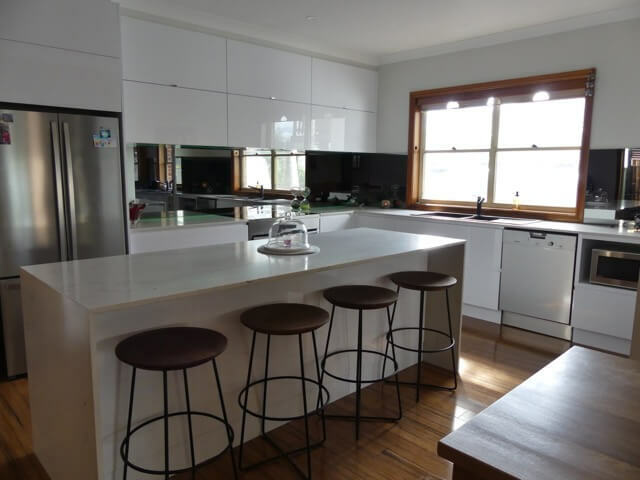 Decoglaze can show you why your next choice should be glass and supply you with a free measure and quote for your net Glass Splashback in Sydney and surrounds.